The nautical theme comes in various looks. 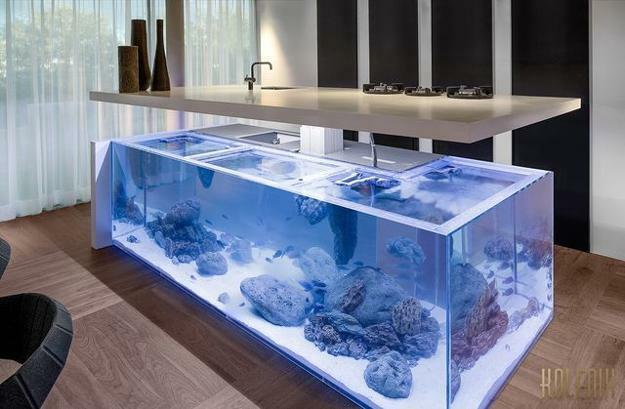 An aquarium built into a kitchen island is a creative and unusual way to bring the exciting nautical theme into a modern kitchen design. Lushome presents this fantastic kitchen design that creates a unique kitchen island and beautifully personalizes this contemporary kitchen interior. 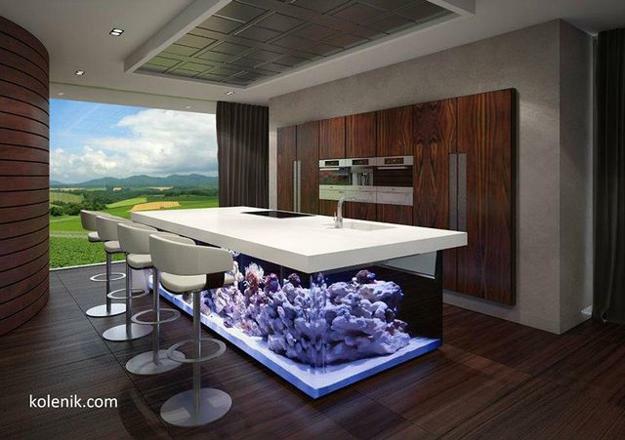 The beautiful kitchen island with an aquarium is an original design idea for creative kitchen design. A large aquarium built into contemporary kitchen island make the kitchen and dining room feel exclusive and luxurious. A designer from Amsterdam Robert Kolenik, www.kolenik.com/ surprised with this spectacular design idea. This luxury kitchen island design amazes and attracts attention. The aquarium kitchen island is functional but unusual and impressive. The large tropical fish tank adds a beautiful element to the modern kitchen and brings a natural feel to the interior design. The unique kitchen island design is called Ocean Keuken. 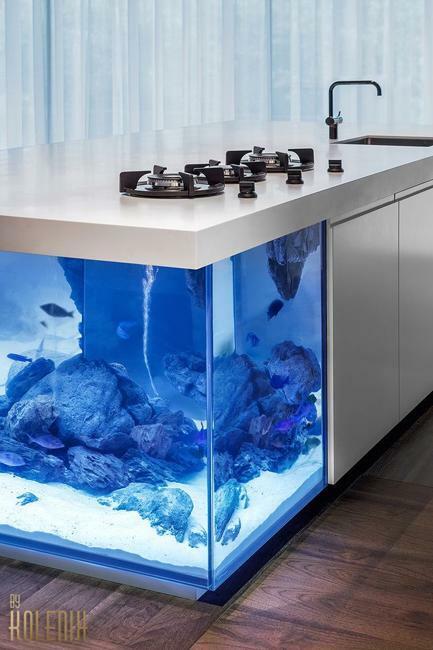 The kitchen island aquarium is big. Its L shaped countertop rises at the touch of a button to allow taking care of fish and cleaning the aquarium tank. 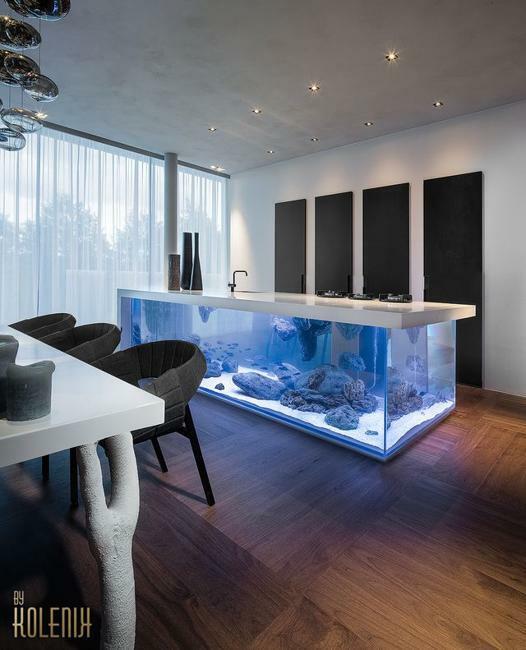 This aquarium is impressive, and the design idea of combining a tropical fish tank with a kitchen island is inspiring and innovative. The aquarium kitchen island unique in its kind art object interior, kitchen island has three burners and a sink. The kitchen island countertop proved a large surface for cooking. The kitchen island can be used for entertaining, adding a spectacular centerpiece to this contemporary kitchen design. The large kitchen island is great for serving lunch and snacks or organizing a cocktail party. The aquarium kitchen island features some storage space also. This fabulous kitchen design idea is taking the world by storm. The nature-inspired and eco-friendly nautical theme beautifies the contemporary kitchen design and demonstrates a novel approach to creating original home interiors. Robert Kolenik is a European designer who is eco-oriented and innovative, demonstrating his down to earth mentality and love for nature-inspired designs, including the nautical theme in interior decorating. This functional and beautiful kitchen island is an absolute eye-catcher, connecting modern kitchen design with nature and adding chic to kitchen interiors. The unique and a bit extravagant oversized aquarium under the kitchen island top is perfect for a spacious traditional or contemporary home and kitchen design in eco style.